As an author of a young adult novel from a male point-of-view, I was excited to read Period 8, and even more excited when I won a copy of an ARC from a Goodreads giveaway hosted by the publisher! Period 8. An hour a day. You can hang out. You can eat your lunch. You can talk. Or listen. Or neither. Or both. Nothing is off-limits. The only rule is that you keep it real; that you tell the truth. Heller High senior Paul Baum—aka Paulie Bomb—tells the truth. Not the "Wow, that's an ugly sweater" variety of truth, but the other kind. The truth that matters. It might be hard. It often hurts. But Paulie doesn't know how not to tell it. When he tells his girlfriend Hannah the life-altering, messed-up, awful truth, his life falls apart. The truth can get complicated, fast. But somein in Period 8 is lying. And Paulie, Hannah, and just about everyone else who stops by the safe haven of the P-8 room daily are deceived. And when a classmate goes missing and the mystery of her disappearance seeps beyond P-8 and into every hour of the day, all hell breaks loose. I love seeing more teen boy-focused books on the shelves. 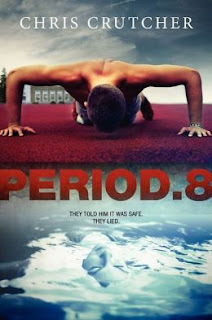 Having said that, I liked Period 8. But I really wanted to love it. I thought the idea of an “eighth period” with an intact cohort group of kids from all backgrounds was fantastic. Add a supposed bully to the mix to this free period and the idea sold me. As others have said in their reviews, the book is not necessarily just a book about bullying (which is suggested on the back cover of the book), because it is so much more. I’m not going to go into specifics and spoil it, because I was pleasantly surprised how this story progressed without knowing the details. Although slow to start, the story held unexpected mystery, suspense and had a thrilling conclusion. Chris created a wonderful world of characters, especially Paulie and the retiring Period 8 teacher "Logs," but the story was so short that you really didn't get to know them all that well. His dialogue is witty and true, and I loved the banter among the characters, but in some places it was a little over-written, other's left me wanting to know more. And that's the gist of my lackluster review. I wanted so much more from this story because I really love the premise and characters. The scenes jumped around and were abrupt when I wanted to dig deeper. It was satisfying with respect to the main theme, however, the ending leaves the door open (maybe there's a sequel?). It's definitely a good quick read, if that's what you're looking for. All in all, Period 8 is a solid offering in the teen boy selection that will appeal to girls, boys, and adults. This was my first time reading Chris Crutcher and I'm intrigued enough to want to read more.